If you’ve not already noticed (and why should you), I’ve started a blog on Boardgamegeek where I plan to post the sort of things I would have hitherto posted here. Comments on my posts here are minimal, spam comments are widespread, so I will probably stop posting here if the new blog works ok. Comments are easier there and more people tend to take notice so hopefully it will be an improvement. The blog is unimaginatively called Trickylight Relief and you can find it here. Feel free to subscribe if you want. In March, I managed to play 23 games of 19 different titles, 10 of which were new to me. The new games were: Eldritch Horror, Bang: The Dice Game, Amber, Auf Teufel komm raus, Council of Verona, CV, Fleet, Potato Man, Nox and Glass Road. I added 12 new games to the collection which were Eldritch Horror, Habe Fertig, Potato Man, Nox, Abluxxen, Dungeon of Mandom, Kobayakawa, Wurfel Bingo, Qwixx: Das Kartenspiel, Zooloretto Mini, Glass Road and Splendor. 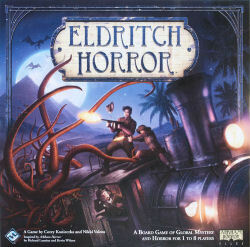 Â My unplayed list has crept up to 31, something I need to reduce during April, and Game of the Month was the excellent re-imagining of Arkham Horror: Eldritch Horror which has a great story to it and can be played in a pretty reasonable time. Our first three player session ended in failure but we all thoroughly enjoyed the experience.